Bryan Todd is a Multi-Platinum and Grammy Nominated Producer/Songwriter signed with UMPG as part of a joint venture deal with Grammy Award winning producer, composer David Foster. He began his career as a recording artist in Los Angeles, garnering attention for a Billboard TOP 20 radio hit “It’s The Way”. Bryan has since written and produced numerous successful artists such as: Miley Cyrus, Jordin Sparks, Ashley Tisdale, Rascal Flatts, Kelly Clarkson, Michael W. Smith, Danny Gokey, Ruben Studdard, Big Time Rush, Snoop Dogg and many others. He has had mulitple #1's on Billboard and also earned the highest soundtrack debut on the Billboard Hot 100. Bryan splits his time between Los Angeles and Nashville and his notable collaborators include Kara Dioguardi of American Idol, Jimmy Robbins, Jeffrey Steele, Andreas Carlsson, Kristian Lundin, and Stephan Moccio. Bryan Todd signed and is producing US pop newcomer Keelie Walker through his 2220 imprint. Keelie made her UK stage debut opening for Jason Derulo’s 2Sides world tour. Now 15 year old Keelie will embark on with the legendary WESTLIFE on a 30 date Arena tour. Her new single NOT YOU produced by Bryan and remixed by iconic DJ Roger Sanchez will be available July 5th. Bryan Todd produced and co-wrote with Three-time Grammy® Award winner and Multi-Platinum Artist Michael W. Smith for his new album A Million Lights. Bryan produced, co-wrote and mixed Conversation, Something In My Heart, Louder, You Make Me Feel This Way and Produced and mixed Footsteps, Revolution, Forgive and Hey Love feat. Jordin Sparks! Click below to Pre-order the album due February 16th 2018. Danny Gokey's album RISE has gone #1 and been nominated for a 2018 Grammy Award!!! Bryan has produced on "Slow Down" and "Stronger Than We Think" as well as remixing his own version of "Stronger Than We Think" which is a part of the album. The set is available worldwide on BMG. Bryan recently co-wrote and produced a track entitled "Wild Anmials" by Pop music newcomer FJØRA. The song just landed on the New Music Friday Spotify playlist in her home country of Canada. A new album is slated for the Fall. 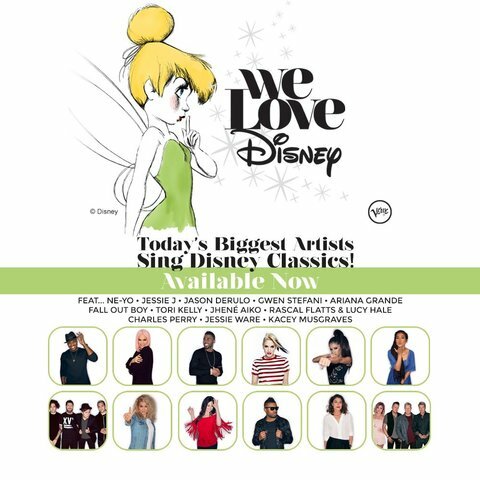 "Let It Go" by Rascal Flatts and Lucy Hale is now available on the Universal Music Group release "We Love Disney". Bryan produced the track along side Grammy winning producer/composer David Foster. The album debuted #5 on the Billboard album chart and also features Ariana Grande, Neo, Gwen Stefani, Jason Derulo and Jessie J.
Bryan Todd has produced the song "Roses and Violets" by Mark Ballas and BC Jean new duo Alexander Jean. The song spent multiple weeks at #1 in addition to scoring the highest debut on the iTunes over all genre chart at #5. The song was written by BC Jean and Stephan Moccio (The Weeknd, Miley Cyrus) who also co-produced with Bryan. Kelly Clarkson - "2018 RDMA Medley"
Michael W. Smith - "Conversation"
Michael W. Smith - "Something In My Heart"
Michael W. Smith - "Footsteps"
Michael W. Smith - "Louder"
Michael W. Smith - "Revolution"
Michael W. Smith - "You Me Feel This Way"
Michael W. Smith - "Forgive"
Keelie Walker - "Hit Me Up"
Danny Gokey - "Stronger Than We Think"
Danny Gokey - "Slow Down"
Alexa Aronson feat. Snoop Dogg - "Music Feels Better"
Rita Wilson - "What You See Is What You Get"
Christian Bautista & Jessica Sanchez - "Two Forevers"
BC Jean aka Alexander Jean - "Roses and Violets"
Ruben Studdard - "If This World Were Mine"
Berlin - "It's The Way"
Lemonade Mouth (film) - (Disney Original Movie) - "Breakthrough"
Sophia Black - "What Can You Take From Me"
Tay Barton - "Live U, Love U, Breathe U"
Tay Barton - "I'm Invisible"
Miley Cyrus - "Welcome To Hollywood"
Big Time Rush - "One More Moment"
Alyson Stoner - "What I've Been Looking For"
Starstruck (2010 film) - "Welcome To Hollywood"
Action Item - "Without You"
The Princess And The Frog - "Live To See You Smile"
The Princess And The Frog - "Do What I Want To Do"
Mitchel Musso - "Welcome To Hollywood"
Jordan Pruitt - "Take To The Sky"
Jimmy Robbins - "Everything To You"
V Factory - "Round and Round"
V Factory - "These Are The Days"
V Factory - "Beautiful Girl"
Mitchel Musso, Emily Osment - "If I Didn't Have You"
Ashley Tisdale - "Over It"
Ashley Tisdale -"I Will Be Me"
Ashley Tisdale -"Who I Am"
Christy Carlson Romano - "Best Time Of The Year"
Everlife - "I Could Get Used To This"
Ho Yeow Sun - "Mine"
Bryan Todd - "Wherever You Are"
Bryan Todd - "It's The Way"
Bryan Todd - "Remember, Get Ya, Feel Ya"